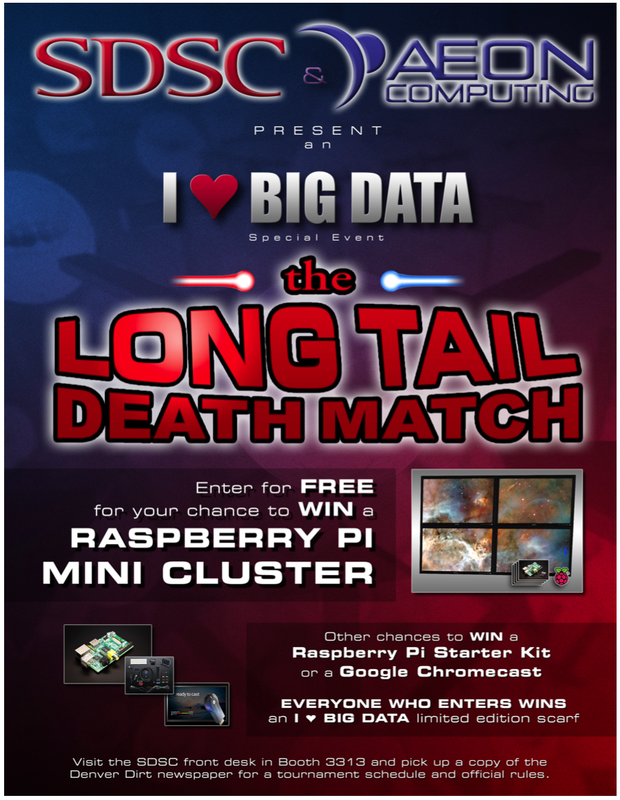 The LONG TAIL DEATH MATCH (highlighted in red) will be a gaming tournament featuring Meteor, SDSC's Raspberry Pi cluster and display wall. 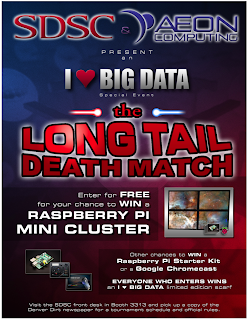 The grand prize for the gaming tournament is a Raspberry Pi mini-cluster with a four-screen (2x2) display wall sponsored by SDSC and Aeon Computing, which is pretty darned awesome. Even if you don't win, finalists all get either a Raspberry Pi or a Google Chromecast. All of my wonderful talks are highlighted in blue. People who attend one of my talks can get an awesome SDSC I ♥ BIG DATA scarf, also sponsored by SDSC and Aeon. As far as swag goes, I think this is pretty cool. The official Comet announcement and press briefing on Tuesday at 2:00 PM has a star-studded lineup. I'll be present for this in an official capacity. Geoffrey Fox, the PI of FutureGrid and a prominent figure in scientific cloud computing from IU, will be speaking on Wednesday at 11:30 AM. John Towns, the PI of XSEDE, will be speaking on Wednesday at 2:00 PM. D.K. Panda, the creator of MVAPICH2, will be speaking on Wednesday at 3:20 PM. Printed copies of the agenda will be available at SDSC's booth (#3313), and I've uploaded a PDF version, complete with details about the LONG TAIL DEATHMATCH, to my website. Opening Rounds, Prizes for Entrants! Elimination Rounds, Prizes for the Winners! Championship Rounds, Grand Prize Award Ceremony! I took a bunch of photos of Gordon and Trestles, the supercomputers at the San Diego Supercomputer Center, in case I needed some material for background graphics or flash for any of the presentations and activities in which I'll be participating surrounding SC'13. Upon reviewing the photos, I realized that there is a lot of technological content captured in them that others, either professionals or enthusiasts, might enjoy seeing. Gordon and Trestles, a set on Flickr. Trestles, a 324-node, 10,363-core, 100 TF, AMD Opteron (Magny Cours) cluster outfitted with a fat tree QDR InfiniBand interconnect designed to accommodate the computational needs of the common man. This machine was deployed in 2011. Gordon, a 1024-node, 16,384-core, 341 TF, Intel Xeon (Sandy Bridge) cluster outfitted with two (dual-rail) hybrid 3D torus QDR InfiniBand fabric designed to tackle data-intensive problems with an architecture very rich in IO capabilities. Sixteen compute nodes in an 8U subrack share a common 36-port QDR IB switch, and an IO node with sixteen SSDs also hangs off that switch. 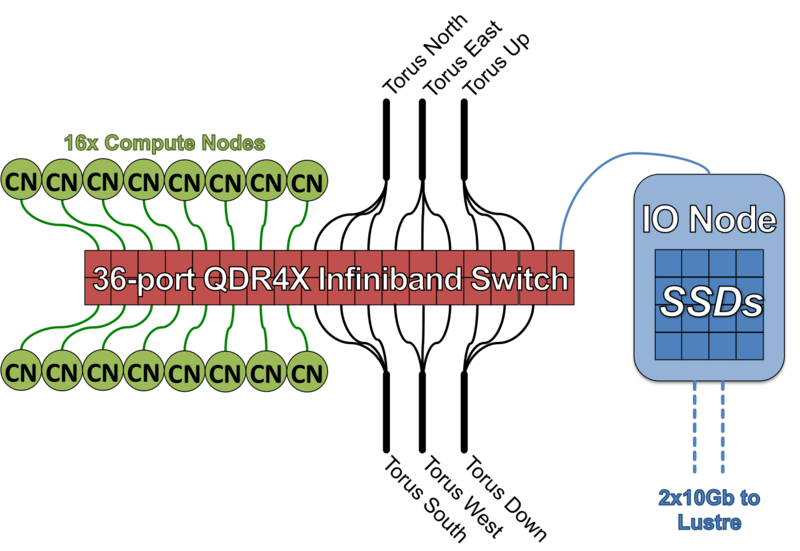 The IO node is connected directly to Lustre via a 2×10Gbe bonded link, and it also provides the SSDs to the compute nodes over InfiniBand. This entire building block represents one torus node on Gordon's overall 4×4×4 torus, and since the whole fabric is really dual-rail, each node (compute and IO) is connected to two of these 36-port switches. This all makes for a very pretty machine. It's been about a year since I decided to quit the life of a research scientist and move across the country to get into the supercomputing business, and coincidentally, it's also time for this year's SC conference. I note the coincidence because hearing about SC'09 from pals in attendance was the first time I realized there was a whole industry surrounding what I considered to be a fun hobby. I'd argue that hearing about SC antics was a major force in putting me on the path that led me to becoming a part of the supercomputing industry--for example, I specifically recall thinking that my dream job would be one that paid for me to attend SC. It seems like I've found that job now, and luckier still, I get to attend SC during my first year in the business. I've had this post open as a draft for the past two weeks and initially intended to write a reflective post on where I've come in the last year, but as it turns out, going to SC is a lot of work, and I don't really have time to do all that writing. The exact times are a little infirm, and I don't have finalized (read: company-approved) titles for these talks yet, but I will update this post when I do. 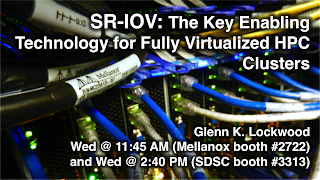 Also, a map of the expo floor is already online; both the SDSC and Mellanox booths are in the lower-right quadrant. On Tuesday at 2:00 PM, the official Comet announcement will be made by SDSC's director, deputy directors, and a bunch of dignitaries from the vendor partners involved. I will be on hand to discuss the project with whoever is interested in learning more and to consume the free refreshments to be served. On Thursday at 10:00 AM, we will be concluding a special event (not sure how much more I can/should say). I will be there for the good times. UPDATE: I've posted the exact schedule on a subsequent post. SDSC has some cool stuff planned for the booth centered around Gordon, SDSC's data-intensive production machine, and Comet, SDSC's upcoming machine designed to address the needs of the 99% of supercomputing users who aren't running ultra-massive hero jobs. Right now there are two separate "lightning round" talks being given: one on Tuesday morning, and one on Tuesday afternoon. 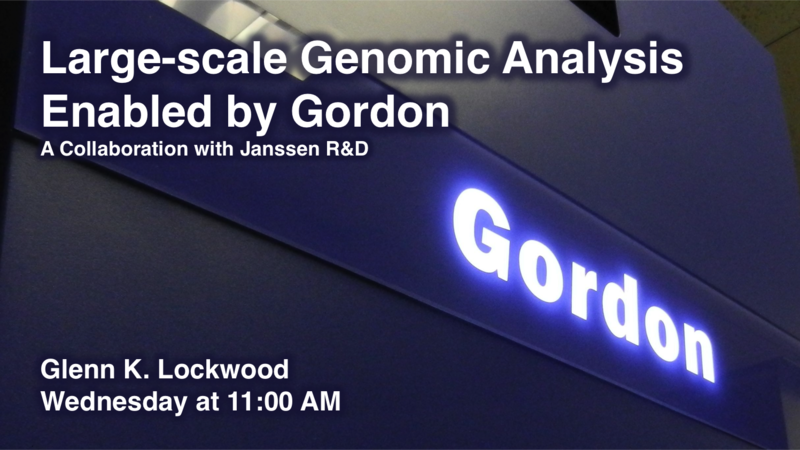 I am presenting different talks at both, as are a number of my colleagues. In addition, I think there is an additional set of lightning talks, but I'm not (as far as I know...but I may be wrong) giving one there. Once the SDSC schedule is available for public consumption, I'll post an update here. Finally, there is a really neat special event for students spanning the entire exhibition which concludes on Thursday morning. I'm not sure how secretive this is, so I won't say more until I know more. I'm presenting on two topics, both of which I think are really neat. In brief, a project came to us that involved processing over four hundred complete human genomes straight out of a next-generation sequencer. The input data came in the form of eight 6-terabyte RAID0 devices which we needed to somehow plug into Lustre to upload, and the ensuing adventure was quite challenging because of the nine-step processing pipeline through which each genome needed to go. It proved to be a fantastic example of non-traditional uses of HPC that, despite requiring only modest CPU power, is wholly intractable without a lot of high-end compute capability. to solve the problem within the parameters necessitated by the project's sponsors. 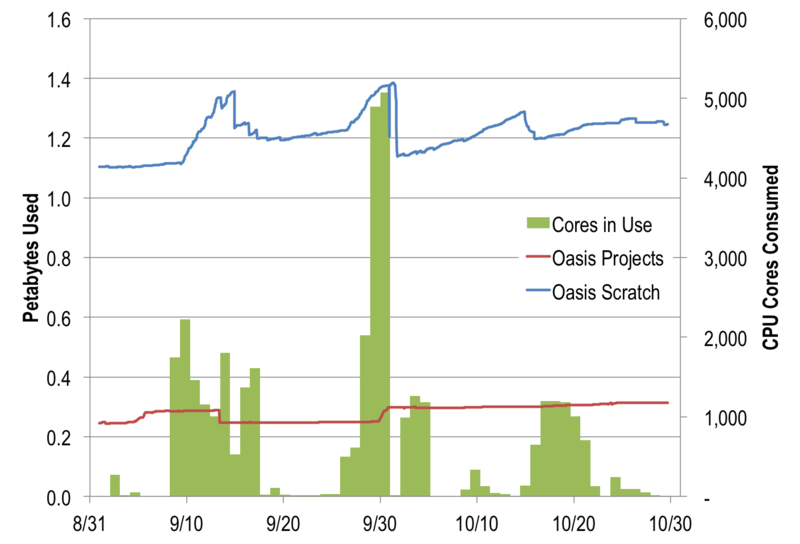 I'm also presenting on some of the early benchmarking work I did with coworkers while architecting Comet, SDSC's upcoming supercomputer. 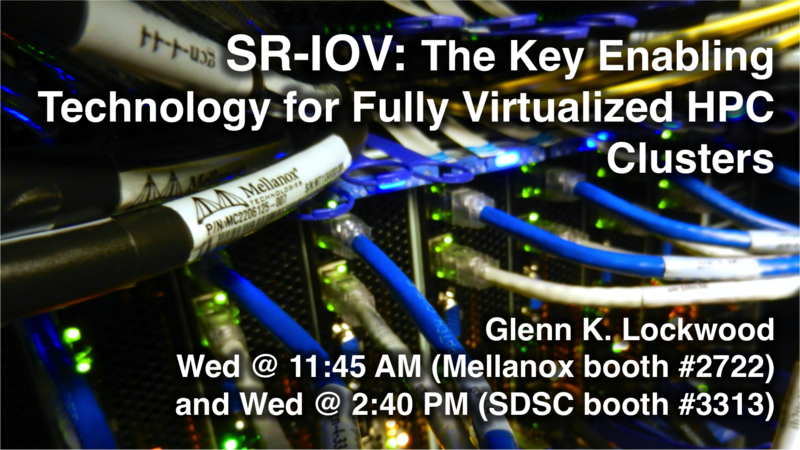 In particular, Comet will rely heavily upon Mellanox's Virtual-IQ technology and SR-IOV to allow users and gateways to dynamically provision virtual clusters with their own software stacks and operating environments on SDSC's hardware. We ran both standard benchmarks as well as real-life applications across these different types of clusters, and the results were quite interesting.